Travel Writing workshop coming up! How to capture your travel adventures, while not missing a thing? How to prep yourself by deciding in advance what kinds of things you want to write about? How to find the right type of journal for your trip? These are the things we’ll discuss in the workshop. You will practice journal writing with timed, flow writing. That means you will write about a topic from a prompt that you choose. You write for about seven minutes, as fast as you can without stopping to think or correct anything. You write fast and free and wild without hesitation, which engages the right side of the brain that makes connections and finds meaning. You will see how to capture memories, conversations, and experiences in the downtime you have. The workshop, “Travel Writing” will be held during International Education Week, next Tuesday, November 14, 3:00-4:15 p.m. at t he Cailloux Campus Activity Center (CCAC) in the Fish Bowl meeting room (2nd floor) on Schreiner University’s campus. McKenna Blackstone, a 2016 study abroad student in Spain, will facilitate the workshop with me. Get inspired before you arrive. 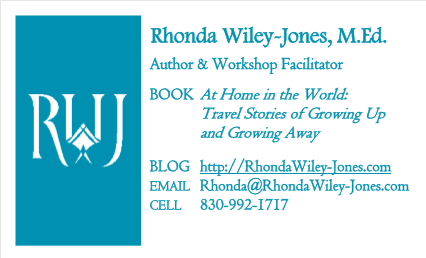 See my Pinterest board, Journal your Travels, for ideas galore on journal writing your travels and adventures.